How to download and install Transport Tycoon Deluxe? Download openttd-1.8.0-windows-win64.exe using one of the provided mirrors. Double click on openttd-1.8.0-windows-win64.exe to run the Transport Tycoon Deluxe setup. Follow on-screen instructions to complete the setup. Once the Transport Tycoon Deluxe installation is completed, launch the game using the desktop or start menu shortcut. A legendary tycoon game which has stood the test of time. Transport Tycoon Deluxe, released a year after the original game brings several improvements including changes and fixes in setting up the transport network. It runs under DOS and Windows 9x. A version for PlayStation was released in 1997, named Transport Tycoon. The game was made open-source years later and can currently be played under an open-source license. The first and important difference between Transport Tycoon and the Deluxe version is the way the signals work. 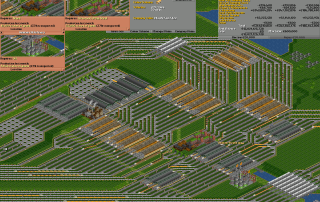 The original Transport Tycoon game only allows bidirectional signals, which allow trains to pass in either direction. The Deluxe version introduces unidirectional signals, which allow a train to pass in one direction. The evolution of the gameplay caused by this relatively minor change in signals is important because the old bidirectional signals would allow trains to travel in both directions. This is a feature which thousands of Transport Tycoon players were looking forward to. The concept is identical to one-way streets, thus limiting the number of accidents, trains can no longer travel against each other. Before the Deluxe version, it was necessary to limit the accidents to build important infrastructures allowing the trains not to meet, which required a greater expenditure of funds. The new continuous signals have allowed the one-way tracks to be built, giving the player a much greater control over how his transportation network is to be traveled. This is to be taken into account for the construction of an efficient route, and to prevent the trains from trying to take a wrong path on a section of track. By incorporating continuous and bidirectional signals, efficient switching areas, junctions, and other practical designs could be built. The Deluxe version has also provided the game with new graphic environments like tropical and arctic regions, in addition to the classic temperate environment. The new environments are used with new industries, and some additional challenges. For example, cities in the Arctic environment do not develop without regular food deliveries, and people in the tropical environment need constant access to fresh water.